Rohingya women and children wait in a queue to collect water at the Leda camp, an unregistered camp for Rohingya in Teknaf, near Cox's Bazar, a southern coastal district about, 183 miles south of Dhaka, Bangladesh. Water could become a rare resource for 5.7 billion people by 2050 unless more sustainable water management practices are adopted worldwide, according to the United Nations’ annual World Water Development Report. Released at the 2018 World Water Forum held in Brazil, the report depicts a stark crossroads. Out of the expected 10.4 billion people in the world by 2050, more than half could be in dire need of water within just a few decades if the status quo of industrial water management and pollution continues. That scenario could also drive “civil unrest, mass migration, and even to conflict within and between countries,” the report states. On the other hand, if nature-based water management systems are adopted by countries, then the expected increase in demand for water by 2050 can be more than offset by the amount of water saved and regenerated. Global Citizen campaigns to ensure universal access to water and sanitation and you can take action on this issue here. Since the start of the 20th century, global water consumption has increased sixfold, according to the UN’s report, and it will continue to grow by an expected 1% annually in the years ahead. During this same period, water sources have deteriorated at an alarming rate. In Latin America, Africa, and Asia, for instance, nearly all rivers have been harmed by pollution, the report says, because of runoff from agriculture and factories. Further, 80% of global wastewater and sewage is discharged without treatment into bodies of water. Meanwhile, around two-thirds of forests and wetlands, which are essential to the maintenance of water supplies, have been lost or degraded during this period. Soil, which also filters water, has been widely degraded because of unsustainable agricultural practices, pollution, and human development. These challenges are being intensified by climate change, which is increasing the likelihood of droughts around the world. 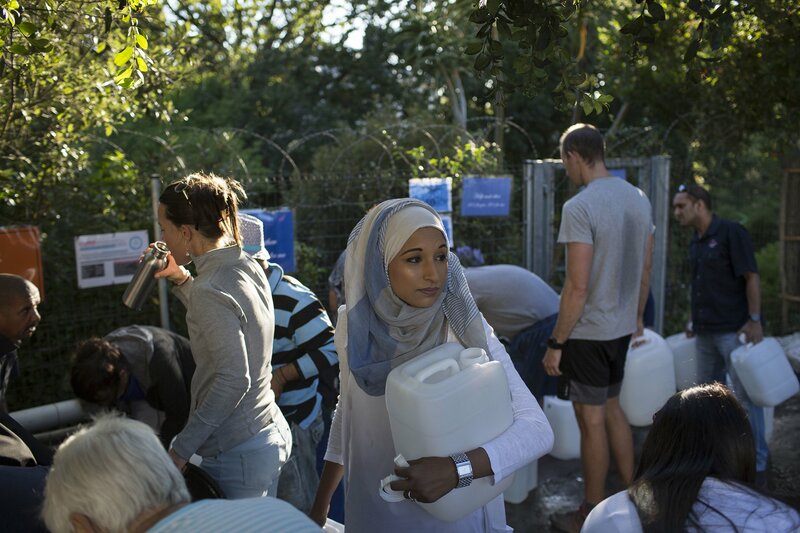 Cape Town, South Africa, for example, is in the midst of a once-in-a-384 year drought and was recently facing the prospect of turning off the city’s water taps. Similar tap water restrictions could become the norm by 2050, the report suggests. A big reason for this is the world’s overreliance on infrastructure like asphalt roads and concrete buildings, according to the report. These materials aren’t porous and prevent rainwater from filtering into soil where it can replenish water sources like aquifers. “For too long, the world has turned first to human-built, or ‘grey’, infrastructure to improve water management,” says Gilbert Houngbo, the chair of UN Water, in the report’s preface. “In the face of accelerated consumption, increasing environmental degradation and the multi-faceted impacts of climate change, we clearly need new ways of manage competing demands on our freshwater resources,” he added. In Mexico City, too much concrete and asphalt has starved aquifers of rainwater, leading to constant water shortages. Another problem is the continual damming of rivers throughout the world, which disrupts ecosystems such as wetlands that protect and clean water supplies. The report discourages the construction of new dams in the years ahead because all the ideal dam locations have already been taken advantage of and any new dams will further disrupt water supplies. A woman walks along the Pepacton Reservoir near Andes, N.Y. The reservoir is part of New York City's water supply and is controlled by the NYC Department of Environmental Protection. While the stakes are high, the UN argues that water sources can be regenerated and maintained in the years ahead if simple changes are made. First, the UN stresses that agriculture, which accounts for 70% of global water consumption, has to become more sustainable. Large- and small-scale farmers have to adopt a form of “conservation agriculture” that promotes reforestation over deforestation, the use of rainwater over irrigation, and crop rotation over monoculture farming to rehabilitate soils around the world. Next, nature-based methods of water collection have to replace industrial methods. This doesn’t mean fully abandoning modern water infrastructure. Instead, it means incorporating practices that can restore, rather than merely deplete, water supplies. The report provides a few examples. First, in Rajasthan, India, 1,000 villages faced extreme water shortages after local forests had been logged too severely and rainfall dropped. Community members were able to overcome these challenges by replanting forests and initiating small-scale water harvest programs that prevented water tables from falling too sharply. Second, the Zarqa River basin in Jordan was being depleted in recent years as the city’s population grew and traditional land management practices were suspended. To curb this decline, communities were once again allowed to practice a form of land management known as hima, which allows parcels of land to be set aside for natural regeneration. This, in turn, helped to stabilize the river. Finally, cities have to develop more green spaces that can capture and retain rainwater and replenish water supplies. These are just a few examples of how small, nature-based changes can restore a community’s water supply, but they’re critical if countries want to avoid severe water shortages in the decades ahead. “If we do nothing, some five billion people will be living in areas with poor access to water by 2050,” Audrey Azoulay, the Director-General of UNESCO, said in the report’s press release.